Learn more about your webmaster! 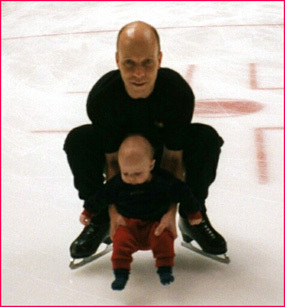 A website dedicated to 4-time World Champ, Kurt Browning! Photos of the famous (& me)! My encounter with the 3-time World & 2002 Olympic Champ! All material Copyright 2001-04 BY JHB ONLINE UNLESS OTHERWISE INDICATED. Contact the webmaster here for more info. The entire cast and crew of "SMUCKERS STARS ON ICE," especially David Baden, Lonnie Biegel, David Hoffis, Jenni Meno, Todd Sand, Jamie Sale, David Pelletier, Kyoko Ina and John Zimmerman, Yuka Sato, Oksana Baiul... and, of course, Kurt & Dewey Browning -- all of whom helped make this wonderful weekend possible! hits we have received here! Copyright 2004 by John H. Baker, unless otherwise indicated. Of course, Kurt looked pretty cool in his brand new shirt-- a gift from tour director Dave Hofffis, who had mistakenly purchased the wrong size earlier that day! But check out the hat on the guy he's with. Kurt got it for doing a TV interview in Phoenix, but he liked the way it looked on me… so it's mine now. Kurt is like that! I'm a lucky guy! 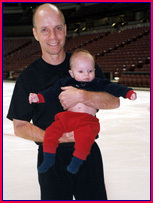 Scott Hamilton and son, Aidan. ...with Scott's wife, Tracy & Aidan.